Soak sama in curd for 3-4 hours. Before using blend it properly with a blender to make smooth batter. Take a pan and heat oil. Add cumin seeds, grated potato and sauté it for 2-3 minutes. Add this to the mixture. Add grated ginger, salt and mix it well. 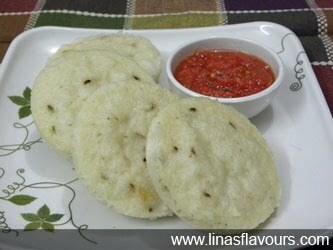 Pour batter into greased idli stand and steam it for 10-12 minutes or till it is done. Serve it with tomato-red chilly chutney. Chop tomatoes. Add other ingredients and blend it in the mixer. Serve it with idlis, fritters or parathas.